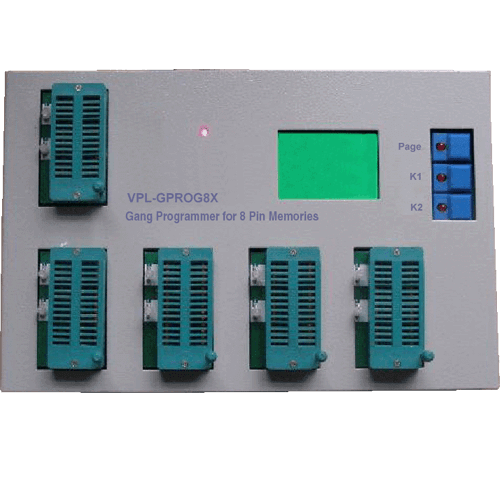 VPL-GPROG8X is an advanced volume production programmer for 8 pin series of memories having online and off-line operation feature. Online operation: USB interface, you can program the master IC. It is useful for production of samples and R&D purpose. No need to make the master on any other programmer. Off-line mass production: one can use for production purpose and can copy 8 ICs simultaneously. A key to trigger the operation of the process: Just click on a button to complete the order, the use of very simple and convenient. Supports a variety of 8 pin series of memory: 24CXXX, 25 series of all, all the series of all. LCD display: Dynamic directed various operational processes, as well as the operation results. Synchronized three-color indicator light direct copy of the results for each instructions on the results of simultaneous buzzer. Counters: the number of successful copies of the IC count. Can be software upgraded: add greatly facilitate the future use of the device libraries the problems encountered. Supports almost a full range of 24Cxx, 24LCxxx, 25Fxxx, 25Xxxx, 25VFxxxx …..